If you have been following me on Instagram you'd probably seen this product mentioned a lot of times. Its no secret that I adore face oils! 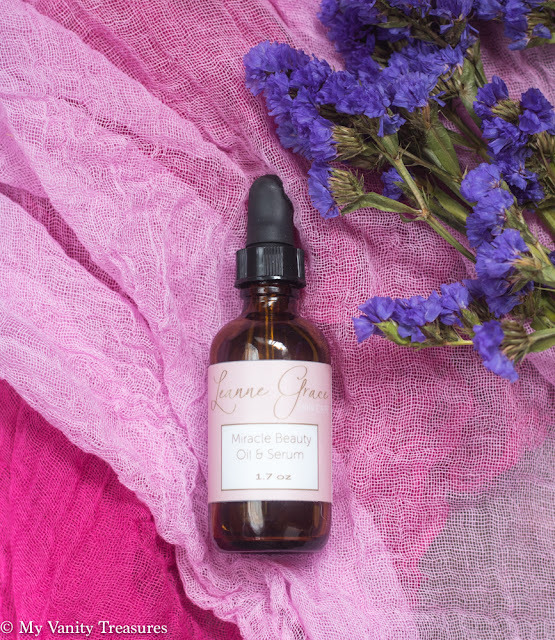 My skin loves them too and one of the first face oil I ever tried apart from the Clarin's Lotus Face Oil was this Miracle Beauty Oil & Serum by Leanne Grace! I picked up mine first time way back in Sept 2015! At that time it was being sold under the brand name The Blissful Body over on Etsy! Back in the day I remember this line being mentioned on Jaclyn Hill's YouTube channel and I thought let me check out! I didn't buy this because of JH, those who know me, know that I never buy anything because of YouTube influencers, obviously they do have an impact but I prefer to do thorough research before investing especially when it comes to skincare! But once I looked at the ingredient list I was sold! The ingredient list reminded me a lot of the Sunday Riley Juno oil but with 1/3 of the price! Now to be fair its not an exact dupe of the SR nor do I believe that was the intention behind creating this oil but overall the ingredient list is very impressive and loaded with healthy omega oils! Lets talk little bit about the brand Leanne Grace! The mastermind behind this line is gorgeous Cassie Platt, she does have background in massage therapy and hence knows her oils! The brand was initially called The Blissful Body on Etsy but recently she changed the brand name to Leanne Grace after her two beautiful girls! How amazing is that? To read more about her and her line check this link out. Apart from this face oil she also has some of the most amazing body butters I have ever tried as well as a face/body scrub! Reviews of the body products will soon follow! She just came out with new skincare products called Boosters which are suppose to be used in conjunction with the Miracle Beauty Oil & Serum. The boosters come in three categories Brightening, Hydrating and Anti-Aging! I personally have not tried any of them but definitely am excited to give try the brightening one as it contains oil soluble Vit C! Lets talk about what exactly does this oil do? I mainly use oils/balms to nourish, moisturise and balance my skin. The texture of this oil is very light weight and absorbs immediately into the skin. With all oils you only need 2-3 drops for your entire face and this holds true for this oil as well. It does smell lightly like lavender as Cassie does mention on her website that since she uses organic cold pressed oils, some of them do have odour and to offset that she uses therapeutic grade lavender essential oil. The fragrance is not strong at all and does not linger behind either so if you have sensitive nose you need not worry. What I love about the formulation is the inclusion of antioxidant rich oils and absence of essential oils apart from Lavender! A lot of oils on the market contain bunch of essential oils, now I personally don't have much issues with formulations that contain the right amount of EO's but often the EO's used are pretty strong and that can really irritate the skin! Hence I recommend this oil for sensitive skin types. I also love the inclusion of Linoleic Acid rich oils, if you didn't know oily/acne prone skin usually have higher % of oleic acid in their natural sebum and lower % of linoleic acid, hence using oils with higher % of Linoleic Acid will balance the skin's sebum production therefore balancing out the skin. If you are interested to learn more about why Linoleic Acid is so important, Lab Muffin has a detailed post on the same, read here. Similarly if you have extremely dry and mature skin you would want to use blend of oils which are rich in oleic acid. I typically will use oils/balms mostly during the night time as I want that extra nourishment since I tend to use retinols and other AHA/BHA based products mostly during the night time. There are exceptions to this rule but more on that later! The morning after I use this oil I find my skin well balanced! I often suffer from dry dehydrated skin around my jawline and nose area whereas normal-oily (depending upon the season) on the rest of my face and this oil helps with balancing out the excess sebum production and also help with dry patches. However I highly recommend using a good moisturising hyaluronic acid based serum underneath for dehydrated skin issues! The face looks well rested, moisturised and plump. It looks like its been on a healthy diet! With prolong use the skin feels and looks better, if you have texture due to clogged pores it will help with that as well, although I highly recommend using a BHA based product to tackle the clogged pores issue but this oil will also help by balancing out your skin. I know a lot of people tend to think oils will aggravate acne situation but I myself am prone to congestion and hormonal acne and this oil has never caused any irritation to my skin nor has it aggravated the acne any further. In fact since it does not contain any essential oils and the blend is rich in antioxidants and linoleic acid based oils, it will help to balance the excess oil production and therefore reduction in acne and/or clogged pores. Also since it has a lot of antioxidants rich oils it will help protecting from damage caused by the free radicals but to get proper protection its important we always wear sunscreen! 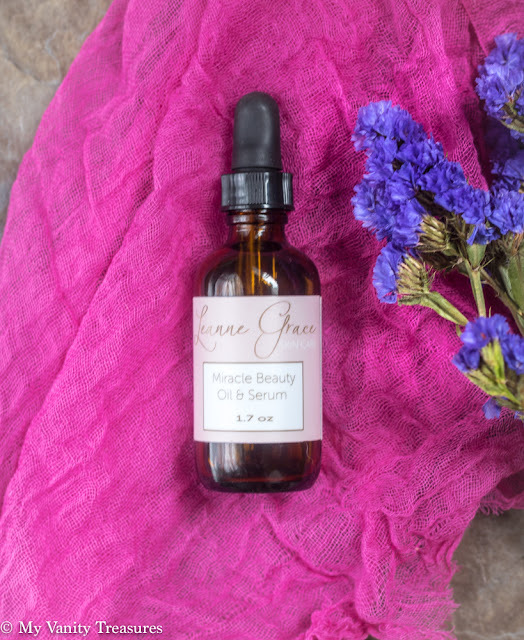 The best part Cassie offers a travel size of this Miracle Beauty Oil & Serum 1/2oz for 20$. If you are interested in trying this oil I highly recommend to invest in the trial size first and 1/2oz is a good size and will last easily for 3-4 weeks even with regular night time use! Plus its at a great price point as well! Taking about great price point the full size of this Miracle Beauty Oil & Serum retails for 52$ for 50ml! Yes! Its not the usual 30ml or 1oz but you are getting almost the double size of any standard oil/serum in the market! How's that for the price vs quantity value? I hope this review was helpful, if you have any questions please do feel free to leave them in the comments section below and I will get back to you as soon as I can. Until then take care and stay beautiful! Thank you for providing us the great skincare serum which has some very useful pros. To take care of skin these days is really important and I think I got the help from your blog.